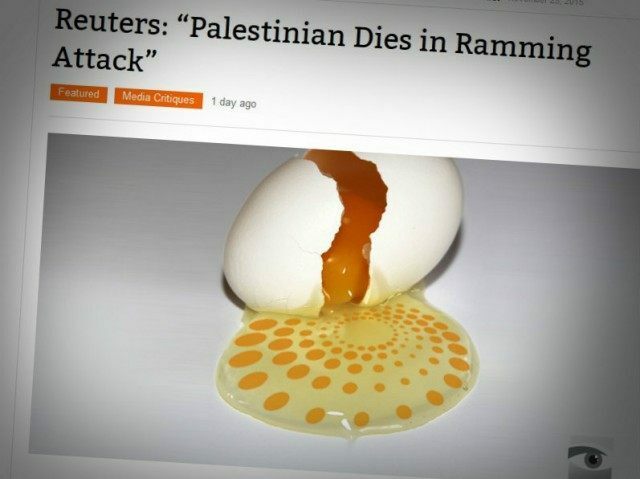 In a misleading header posted above a video report on the vehicular assault, Reuters made no mention of the soldiers who were wounded and instead chose to focus on the terrorist who was shot and killed by Israeli forces. In failing to mention that the Palestinian was a terrorist, readers of Reuters are also led to believe that he was a victim in the attack. Palestinian media reported that the attacker was identified as Ramallah resident Fadi Hasib, the brother of the terrorist Shadi Hasim who also perpetrated a car-ramming attack in the same area last week. HonestReporting.com put a call out requesting readers to demand that Reuters change its headline. As of this publication, the headline remains unchanged.